Utica, N.Y. – Two new exhibits open at the Oneida County History Center on August 9, 2018. Read below for a description of each. An opening reception will be held on Thursday, August 9 from 5:00-7:00 pm. Light refreshments will be served. This event is free and open to the public. World War I Centennial: Oneida County and New York in the Great War commemorates the 100th anniversary of the United States’ entry into the first World War by focusing on the American experience and local history of the war. 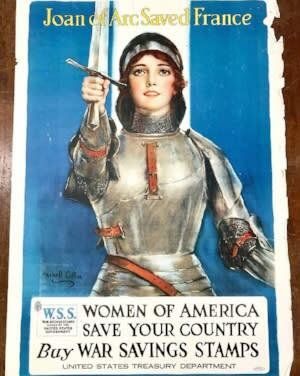 The exhibit uses original documents, artifacts, and posters to explore topics such as New York’s efforts to fund the war and conserve resources, technological innovation and its impacts, women in the war, and individual Utican’s experiences during the conflict. Come celebrate and learn more about local history during this critical and transformative period for both America and the world. World War I Centennial was created by Jolene Patrina of West Simsbury, CT, a rising senior at Colgate University. As a History major and Anthropology minor, she has taken great pleasure in creating the World War I exhibit and working hands-on with the materials available. She is interested in pursuing a career in museum work to further explore and engage in history. Downtown at its Best invites you to relive your most cherished memories of downtown Utica featuring history and memorabilia from department stores, restaurants, and theaters that were once a staple of downtown. 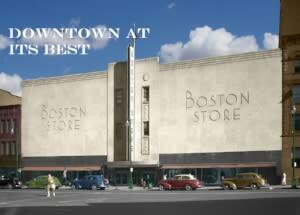 The Boston Store, J.B. Wells, the Olympic Theatre and Kewpee are just a few of the businesses featured. This exhibit was created by Whitesboro High School juniors Emily Depietro and Derek Smith. Both students volunteered their time to research and design this exhibit and enjoyed the opportunity to learn more about Utica’s extensive downtown history. Downtown at its Best was created to evoke the memories that downtown Utica created for some many people over the years and to inspire new generations to discover their vibrant local history. The opening reception takes place in the center&apos;s main gallery on Thursday, August 9 from 5:00-7:00 PM. This event is free and open to the public. The Oneida County History Center, formerly the Oneida County Historical Society, is a private 501(c) (3) not-for-profit educational institution and is dedicated to preserving history and promoting the culture of the Greater Mohawk Valley. Admission to this event is free for the general public; donations are encouraged. Please contact the center at 315-735-3642 or visit the OCHC website (www.oneidacountyhistory.org) or Facebook.com page for additional information.